For as long as I can remember, fall has been favorite time of year. It surpasses summer because it is cooler; it is better than winter because it is warmer; it beats spring because I sneeze less during the autumn months than I do during the spring months. I love the way the leaves change colors and fall to the earth, I love the way the Carolina wind comes in and gently reminds us that change is coming, and most of all I love the metaphysical environment it creates – things just feel different in the fall. Tree Heresies is a book that makes very little sense on first reading. It seems to have a common narrative thread and yet it rejects the commonality of the single narrative. It is about everyone else while simultaneously being remarkable individualistic. 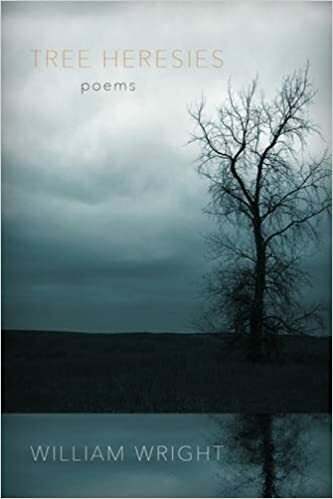 While reading poems like “Nightmare Revised,” “Boyhood Trapped Behind the Eyelids,” “My Other Body,” “Tree Heresies,” and “Ghosts in Winter,” I felt as though the narrator of the poem simply had to be a real, living human being. In fact, during my reading, I felt absolutely certain that the narrator and the writer must be the same person. But this cannot be: the poems are too varied, too gender-fluid, too here-but-also-there to be about the same person. And then again, perhaps they are about the same person, after all? Perhaps Wright’s brilliance is that he has written a collection of poetry that truly understands the tension that must be held between the uniqueness of each human being and the common-ness of each human being. And perhaps I’m reading much too far into this. I thoroughly enjoyed Tree Heresies precisely for that reason. The question was always on my mind: am I reading too much into this? Is any particular poem attempting to tell me something autobiographical, the way poetry so often does, or is any particular poem attempting to paint more an image, and nothing more? I don’t have an answer to that question. Nowhere in the collection does Wright slip up, allow the narrator to take off their mask and reveal their identity. The collection very well could be about Wright; it could also be a complete fiction. But that tension allows for a universality that I have found in a remarkably small number of other collections. As Judith Butler, expanding on the philosophical works of Hannah Arendt, suggests in Notes Toward a Performative Theory of Assembly: “what happens there also happens here, and… ‘here’ is already an elsewhere…” Here truly is there, and there truly is here. This could be a work of autobiography, and this could be a work of fiction. But the reality is that if here is there and there is here, then autobiography is fiction and fiction is autobiography. The tension between the two is where Tree Heresies exist, and Wright’s skillful use of language allows for such a tension to almost be a comfort, even during the long autumn months.